This is it. It’s finally here. The first day of school. There’s probably just one last question on your mind, “Are we going to have a meltdown when I drop this kid off at school?” The answer to that question depends on well you’ve prepped your child to separate at drop-off time. If you’re a regular around here you know we preach preparedness. 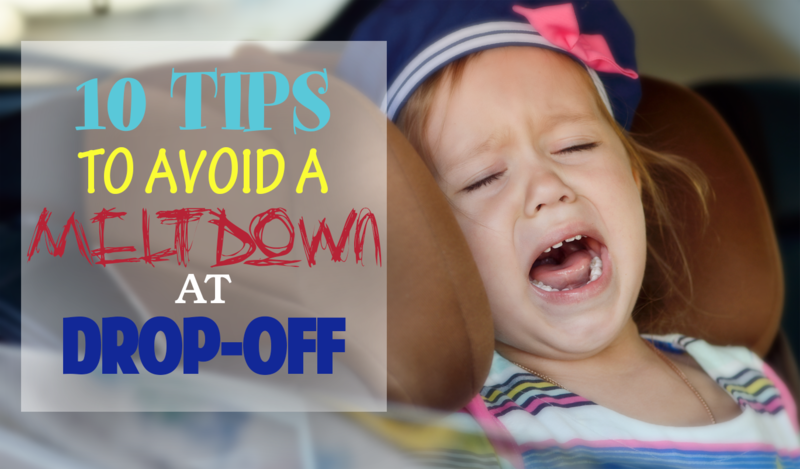 You’ve done all the right things to avoid a meltdown at drop-off. You’ve read everything we have on preparing for the first day of school. You’ve taken your child to playdates at other people’s homes. She’s become accustomed to being in the care of others. He’s confident that you always come back. You’ve read books and watched videos about the first day of school, and you’ve attended meet-and-greet day with the new teacher. Do all these things guarantee no tears at drop-off? Unfortunately, no—but you’re definitely setting your child up for success on the first day and if any the tears will last minutes not all day long. I owned an operated a preschool for many years. I have watched thousands of children transition to a new school environment. First-time parents get it right very seldomly. I totally get it. The separation goes both ways, but this is your child’s right of passage. This transition will present itself many times over, but you just have to trust that you have done your homework and your child is in a safe and caring environment. Below are our top ten tips to put in in the best position to avoid a meltdown at drop-off. Create a Stress-free Morning. Prepare all school clothes, lunches and backpacks the night before so you’re not trying to figure out the plan when there should already be one. Serve Your Child a Good Breakfast. Empty tummies create another point of stress for your child. During breakfast encourage laughing and excitement over the big day. Schedule a Potty Break. Before getting in the car, make one last trip to the bathroom. The goal is to remove all possible things that can add stress to your child’s thoughts. Manage Your Own Emotions. Avoid statements like, “I can’t believe my little boy is already starting school,” or “What am I going to do all day without you?” Save your own breakdown for after drop-off. Make a Habit of It. Walk your child into school (particularly if they are a two-year-old) for several weeks before attempting the drop off carpool line. Don’t Carry Your Child Into the Classroom. Never carry your child into the classroom. Hold there hand only. You’re creating a harder physical and mental bond that will need to be broken in moments. Also, it’s much more difficult for a teacher to take a child out of a parent’s arms then it is just to take their hand. Be Short, Sweet and Consistent. This is probably the hardest part. Make your goodbye a simple one. Lingering on will prime your child for a meltdown. Provide a Favorite Toy or Blanket If Possible. Ask the school before doing this, as they may have rules. A special extra kiss on a tissue or a picture with a kiss that can be tucked in a pocket can also be helpful. Keep in Mind That Drop-off Tears Are Normal. Some children do really well for the first two days and then develop a habit of waterworks once reality sets in. It’s ok if it does. Just keep going. You’re doing the right thing. They will stop. I promise. Going to school for the very first time is a milestone in your child’s life. 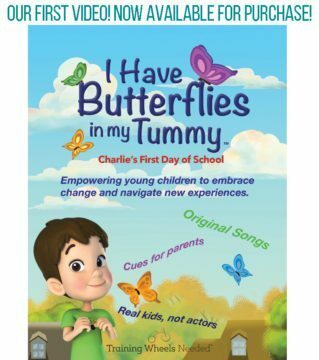 Remind your little one that we all get butterflies in our tummies when we are doing something for the very first time, but butterflies always fly away. If you prepare your child and yourself by following our top ten tips you’ll be in the best position to avoid a meltdown at drop-off. And don’t forget—treasure the moment. Announcing the release of our first children’s video!